ADMK’s Atrocity At Kasi Theatre !! Fans Emotional Response With A WARNING !! Whether it is the producer (Sun Pictures) or actor (Vijay), or theatres– they will have to face action,” he told reporters. 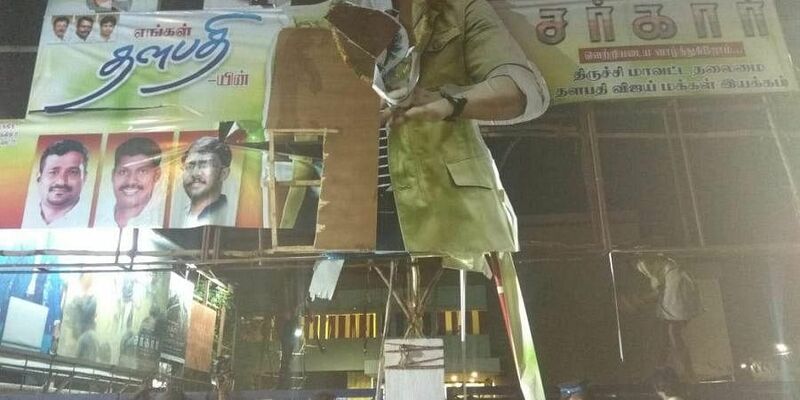 At some movie halls in Coimbatore and Chennai, banners of the film and that of Vijay were damaged allegedly by AIADMK supporters. Some AIADMK workers staged a sit-in at a theatre in Coimbatore seeking a ban on the film. In Chennai’s prominent movie hall Kasi theater’s cut out of Vijay also damaged by ADMK supporters it is alleged. “If they leave him (Vijay) alone , he will be quiet as usual. By doing these kind of agitations, they deliberately nearing their disaster. The effect of their atrocity against Vijay will be something they never expected” he warned. “You guys can only do this kind of cheap activities, touching him will be a nightmare for you when we are there for our brother. If you really have guts, you would have did this in the first day itself. I don’t care if my future spoils because of this, I will stand with my anna and fight for him” said the fan. They also questioned why they are demanding to remove scenes from a film which was censored already by central government. Another fan also alleged that a police officer slapped him while he questioned why ADMK supporters are behaving this rude. Previous articleBREAKING : Police At A.R Murugadoss House To Arrest Him !! Whole Tamil Industry Explodes !! Next articleAfter Police Banging Murugadoss House At Midnight !! Here’s What The Director Is Upto ! !